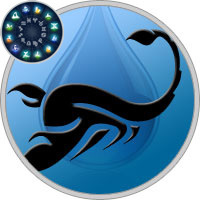 Scorpio is a fixed water or icy sign, the eighth sign of the zodiac and is rising at your birth. You have received some pretty bad press Scorpio and are probably the most misunderstood sign. You show a cool aloof exterior to the world but underneath you have a scorching and passionate nature. Both Mars (aggression) and Pluto (magnetic forces) rule the sign of Scorpio, so the battling energy of Mars and the hidden depths of Pluto will influence you. As the old saying goes "still waters run deep" and you could be likened to having the power to wear rocks away, or at least reshape them, given enough time. Unfortunately what people don’t understand, they fear, and this is the case with you. You need approval and the emotional part of your nature is the most significant area of your life, even though you don’t often verbalise it. Although you demand a lot of others you are no less demanding on yourself and when you give your heart to someone, and they in turn give theirs to you, you are the most loyal person. You absolutely adore the idea of love and this is a challenge that constantly excites you. Your home is indeed your castle and you like it tidy, orderly and a place to which you can retreat. The home is jealously guarded as this is your territory and reflects your personality, likes and dislikes. Tenacity is one of your strengths and when you decide to do something, it takes a lot to talk you out of the project (even if someone has the gall to try). You give it your all and will push the boundaries as far as needs be to achieve what you want, whether in business or personal life. You are sensual by nature and with your alluring magnetism draw people to you from all walks of life, whether it is social or professional. You have a powerful and magnetic aura and cannot walk into a crowded room without being noticed, even before you say or do anything. People are attracted to you and as you are the strong silent type you possess something that makes it near impossible for others to ignore you. You are well aware of your power and can manipulate anyone who comes within your orb, and you love it. This secret and enigmatic power of yours is probably your greatest strength. It’s a well-known astrological fact that Scorpio’s eyes can hypnotise, and this is a physical trait you possess. People may even say to you "you have the most amazing eyes". Your eyes are the perfect tool for communication and express the whole range of your complex and changeable emotional states. You can be single minded and this may be mistaken as being insensitive to the needs of others. However it is only because you want to be the best at what you do and there are no half-measures with a Scorpio, be it friendship, love, family life or profession. You aim to be the best and will not allow anything to stand in the way of your success. Determination is yet another of your keywords, but you are quite prepared to share your successes with the people you take care of whether family or friends. Any obstacle or challenge that comes your way, whether naturally occurring or placed there by competitors, will only serve to make you prove you cannot be stopped once you have made your mind up. If someone tries to corner you or put you in a difficult situation they’d better be prepared for your competitive nature to come to the fore. You have a ruthless streak in your character and won’t give in until the job is done and the enemy totally vanquished, even if you have to patiently wait until the appropriate time to seek revenge. Pity the poor unlucky recipient of that vengeance when you unleash it! You are not afraid of the dark, even though you aspire to the light and all pleasure becomes part of your domain and your sensual appetites need to be fulfilled. You give 100% and expect that percentage to be returned, and it usually is. It is interesting that a Scorpio can be equally as successful as a saint or a sinner and will stop at nothing to achieve their aims, whichever way they decide to go. Scorpio has three totems that describe its nature - the scorpion, the lizard and the phoenix. The scorpion is the most vengeful and dangerous aspect of your nature and if you’re operating on that level you’ll constantly seek to hurt others with your power. The lizard represents the class of scorpions who hide from life and never quite achieve the full measure of their power. They often seek self-destructive outlets such as drugs or even criminal activities to fulfil their obsessive needs. If you aspire to the best scorpion character then you’ll be represented by the phoenix that is seen rising out of the ashes. Generally we find Scorpios aspiring more to the latter phoenix quality. Your appearance will be well proportioned, a strong body, muscular with a broad face and a majestic commanding look. As already mentioned your eyes are your strong point and as the enigmatic planet Pluto rules a Scorpio, you’re also fiery and aggressive. You are a tireless worker and generally achieve great success after the middle part of your life. Birthdays are fun, and they can also be informative. Astrologically, each day supplies a collection of influences that contribute to creating a personality which is uniquely yours and yours alone. We hope that these Scorpio Birthday Horoscopes will help you understand yourself better. Look up your birth date to read about your astrological personality.